FIND WELL WATER BEFORE YOU DRILL! WE CAN HELP YOU KNOW YOUR WATER SITUATION BEFORE YOU DRILL! IF YOU ARE A HOME OWNER, LAND DEVELOPER, ENGINEER, OR BUILDING CONTRACTOR WE CAN ASSESS YOUR GROUNDWATER SITUATION SO YOU HAVE ACCURATE AQUIFER DATA BEFORE YOU OR YOUR CLIENT BREAKS GROUND. WE HELP DETERMINE THE POTENTIAL FOR A PRODUCTIVE WELL ON YOUR PROPERTY BEFORE YOU DRILL! 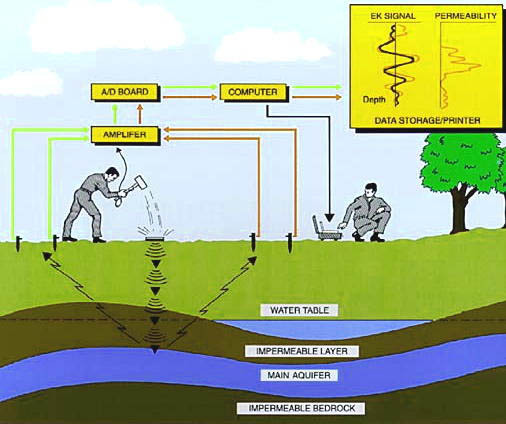 The Electroseismic method, sometimes called the Electrokinetic Survey (EKS) method, is a geophysical technique that attempts to provide the depth to groundwater and an estimate of the permeability, and hence yield, that might be expected from a well drilled into the aquifer. The Physics of the method has been understood since the 1930's when Thompson (1936) and Ivanov (1939 and 1950) were the fi rst to realize that a seismic compression wave (p-wave) impulse will provide sufficient oscillating pressure in rock pore fluids to produce a measurable oscillating electrical potential at the ground surface. The Electroseismic method is related to the commonly known phenomenon called streaming potential, where flowing subsurface water produces a voltage measurable on the ground surface. A more distant relative of the method are thunderstorms where rapidly rising air produces electrical charge separations, thus creating large potential differences. Since the papers by Thompson and Ivanov were written, many investigations into the method have been completed and many papers have been published; the more significant of these are listed at the end of this document. Until recently, the electrical signal from a seismic pulse impinging on subsurface groundwater was difficult to measure since electrical noise, especially powerline noise, contaminated the data. However, Groundflow Ltd, based in the UK, discovered a new detection method that is now patented both in the UK and USA. This method uses electrically isolated lines from each electrode pair, referencing their potentials to a floating virtual earth, and positioning the electrode pairs close to the seismic source, thereby achieving a significant improvement in the signal to noise ratio. A significant amount of research is now being done into this method with organizations such as the Massachusetts Institute of Technology (MIT), Exxon Production and Research Company and the Australian Nuclear Science and Technology Organization becoming involved.